With another great season ahead for blue cruise yacht charter it might be difficult to make up your mind on whether to just cruise the Mediterranean, the Aegean or both. All regions hold special yacht charter destinations that offer a great deal of opportunities for splendid sailing charter holidays with your family and friends. However they can all be so different in what these regions have to offer. If you are an island hopping enthusiast and love the sailing experience, you have some really good options. Between the Mediterranean and Aegean, you will find more islands to hop in the Aegean, provided that Greece is in your plans. Greek Island hopping holidays have been a prize choice for vacations in the tropics, this side of the globe. Your journey could begin in Turkey; such as the picturesque harbor of Bodrum or the colorful city of Marmaris, as the islands are quite close to these two major ports in Southern Turkey. From there, a variety of itineraries can be organized to give you an experience of both cultures – or heavily in one – Greece. Except for the Cretian island group, the Cyclades, Dodecanese, Ionian and Sporades are found in the Aegean sea as is Bodrum harbor. You can design your route to be one way or return. If you choose a one way route, your travels could begin in Bodrum and end in the magnificent city of the Greek Gods, Athens. With a trip such as this one, you might like to give yourselves at least a day to explore your embarkation point, Bodrum and visit a few sights, do some shopping, have a bite to eat at the marina and then see the famous landmark, St. Peter’s Castle. On the following day after breakfast, venture out to sea to discover the wonderful destinations that lay ahead. At the end of your blue cruise travels, a slow paced laze-about in Athens with a tasty lunch at the harbor – not forgetting to see the world re-known Temple of Olympian Zeus might be a few delightful additions to top it all up for your vacation. Should you choose to do a return trip from either Bodrum or Marmaris, you have many more options in itineraries to consider for your yacht holidays. From these two points there is an array of flexible itineraries to look at. A mixture of the Turkish coastline along with island hopping in the Dodecanese and Cyclades is possible. Depending on the yacht charter you decide on, you could go as far out as the Ionian islands or Sporades. 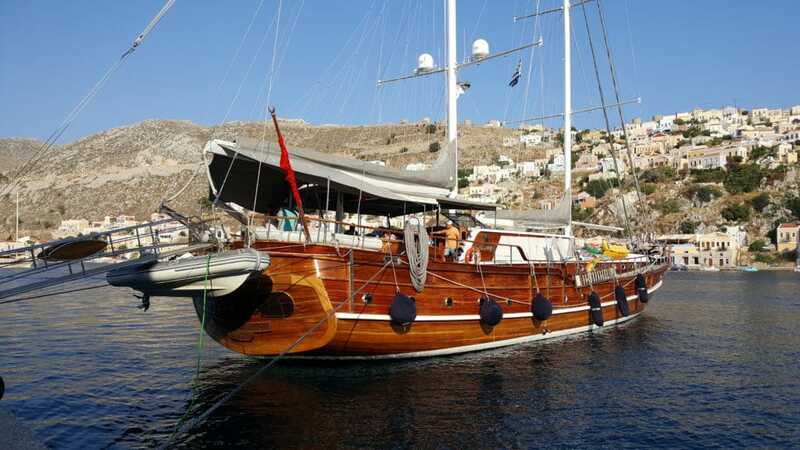 For routes that involve a great deal of open sea travel, a luxury sailing yacht such as Virtuosso, Muhtesem A and Kaptan Mehmet Bugra Gulet could be ideal choices — among other luxury yacht charters. However you don’t need to travel too far out to be able to enjoy a fantastic island hopping holiday. The Dodecanese has some of the most beautiful islands found in Greece such as Rhodes, Symi, and Kos to name a few. Although there doesn’t seem to be as many islands in Greece and Turkey situated in the Mediterranean region right so close to each as it is in the Aegean, one great itinerary that will offer some very interesting travels is from Marmaris. This route starts in Marmaris and cruises to three island groups; namely the Dodecanese, Cyclades and the Ionian island of Crete – one way. This is a fantastic route to take as your travels take you to the beautiful islands of Rhodes, Halki, Karpathos, Kasos and ends in Crete. Whatever your style, you can book a blue cruise yacht charter in the Mediterranean or Aegean or both. Just discuss your ideas with a professional yacht charter agent in order to plan and organize the best itinerary and yacht charter for a unforgettable holiday for the new season ahead!